Can you taste that strawberry up there in my picture? It is a HUGE berry and normally I'd be scared to eat big berries because they tend to be more on the tart side. NO this berry and all of it's big berry friends have been the sweetest and most delicious strawberries that I've ever tasted in my life! I was so tempted to just stuff my face the whole time but we managed to pick quite a lot. 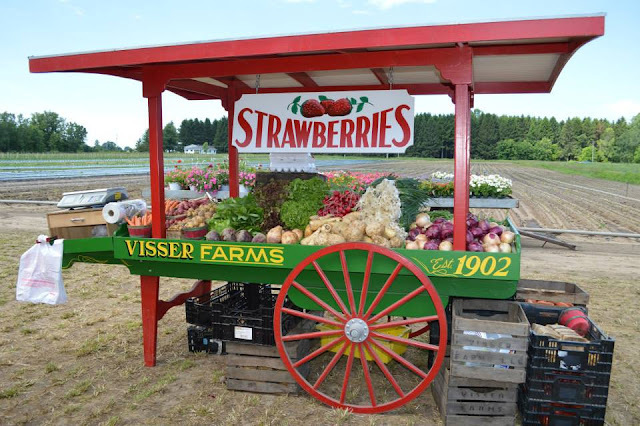 I took my family over to Visser Farms in Zeeland, Michigan this past Monday to have fun at their 4th Annual Strawberry Extravaganza. We enjoyed the wagon rides, free balloons, free food, face painting, and U-Pick strawberries. U-Pick were $1.65/lb and that seemed a bit high to me until I tasted one berry. Their berries are packed with sweet goodness and worth every penny! I would pay much much more for them if I had to do it all over again. All together we must have picked about 50 lbs total. By the end of it all my toddler's face was dripping with red juice and we'd drank up all of the waters in our cooler. I definitely recommend bringing a small cooler filled with several bottled waters if you will be out in the berry patch long. We bought boxes with the containers inside for $2.50 each. I was told that if we return them they will refund that so it's a good deal all in all. I froze most of our berries with my vacuum sealer for our morning smoothies and such. I'd bought a huge bunch of bananas from Sam's Club the day before to chop up and bag up some quick smoothie packs. I also saved a couple quarts out to make some baked goods and for eating fresh. While at Visser Farms I also bought a bunch of produce off of their cute stand. I got beautiful zucchini, the most tender baby yellow summer squash, perfect rhubarb, sun ripened tomatoes, and three bags filled with baby potatoes. The quality of their produce is above compare! One recipe that we have thoroughly enjoyed was a simple strawberry rhubarb crisp. It's perfectly tart and sweet with a delicious crunchy topping. You will only need a few ingredients to make this happen. A crisp is the perfect summer treat especially if you have some fresh whipped cream to put on top. My recipe is simple, hope you enjoy! 3. Pour the fruity mixture into a greased 8"x11" pan or you can even use a 9"x13" it will be fine. 5. Blend the crumb topping mixture until it becomes soft, creamy and crumbly. Sprinkle this over the top to cover the entire pan. 6. Bake for about 1 hour on a parchment lined sheet pan (it will bubble over). Let cool for 5 minutes or so before serving. This is great with vanilla ice cream or some whipped cream.